If a week is a long time in politics, three years is an eternity in business. The speed of technological, social, political and economic change is rapid, and as is illustrated by global events such as Brexit, sometimes unpredictable. Decisions made by global leaders can impact whole industries with little notice and less consultation. Traditional strategic plans for corporations are blueprints for development over a three- to five-year time frame. Let’s do a tiny experiment in time travel. If you got into a room with your colleagues at the start of 2013 to work on a three- to five-year strategy for your business, you did so making assumptions about the trends that would shape your markets, your access to labor, your competition. Now, look around at the business environment. How many of those priorities, drivers and forces remain in place today? Disruption and seismic shifts are the new normal. The forces that require a strategic response today are, for many industries or sectors, already significantly different to what had been anticipated even three years ago. How can communicators establish a strategic response to changing times? Organizations exist for a purpose, and for the majority, that purpose is financial return. The process of strategic planning provides direction for all parts of an organization to align to deliver on the purpose, through building capability, responding to external factors, mitigating issues and risks and focusing effort. The opportunity for communication is to contribute to the business outcome through the tools and capabilities of our profession. This is an extract from my article for Communication World, Rethinking Strategic Communication for Changing Times – Communication World in the February edition of Communication World. 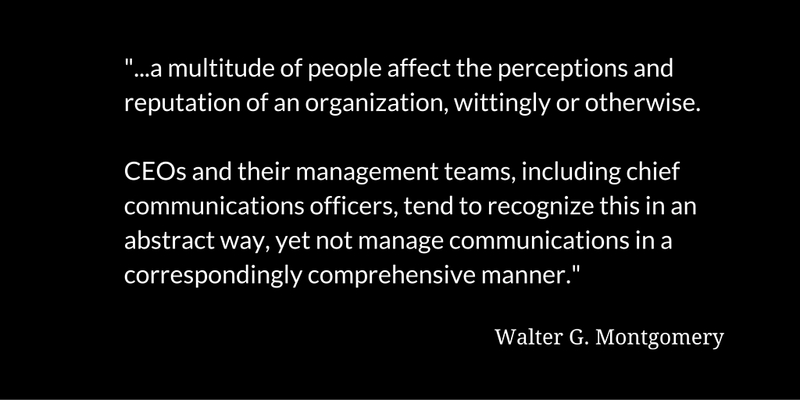 “Communications is an undervalued, lightly regarded discipline in the theory and practice of corporate leadership” writes Walter G. Montgomery in an excellent piece in Knowledge@Wharton, How CEOs Can Adopt a 21st-century Approach to Communication. Clearly and repeatedly send the message that communication is valued and essential – including as a requirement for career advancement. Be scientific about effective communication – new advances in data science and cognitive studies should form a part of effective communication design. View the communication environment holistically and assess it as such – it isn’t outsourced to a comms team. Skill build for all with a communication responsibility. Make the top communication job a strategic one. Focus tightly on values through communication activity. 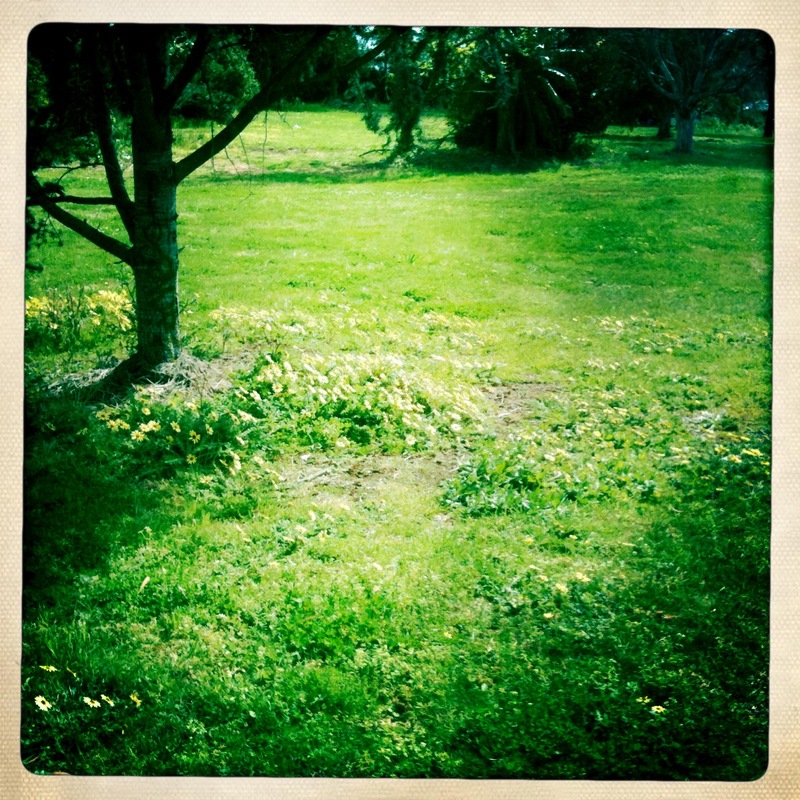 people are back at the gym, and healing the winter lawns. Winter bodies and gardens aren’t the only thing that benefit from some care and preparation for the seasons ahead. Like all natural systems, an effective communication strategy requires time and focus to grow. We are quickly approaching the last financial quarter for 2011. Taking time before the new year to ensure your communication system have all the levers in place will be essential to delivering the 2012 business strategy for your organisation. 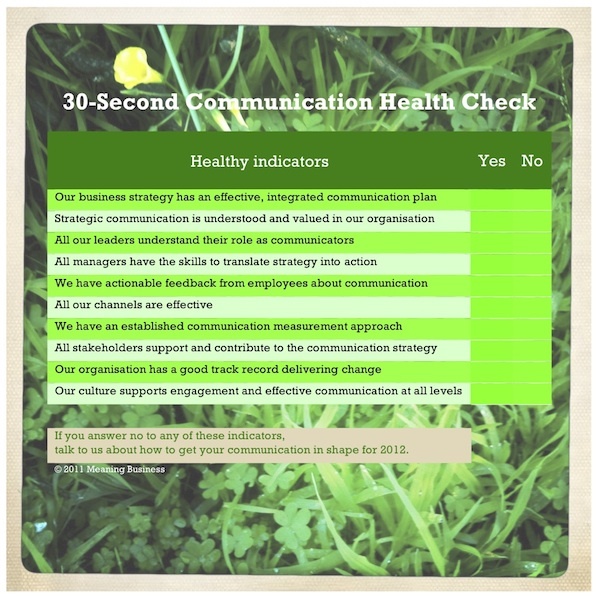 Take this 30-second health check to see how prepared your communication function is for the new year. Business performance can be improved with effective communication in your business. As a communication leader, you need to be ahead of the curve when it comes to communicating strategy. If any of these levers are not in place, you may not get the results you are aiming for from your communication efforts. We have a spring special on communication health checks for small and medium size businesses. Contact us on +61 412 504 252 to discuss how this special offer can help your business, or email us via this spam-safe link http://scr.im/meanbiz. I recently ran a planning session with a group of senior communicators. Working in a challenging environment, they have a great record for delivering innovative solutions that meet their client’s needs. The list of team achievements over the past few years was impressive. They do this in a complex, time-poor environment that has undergone major change over recent months. The middle of the calendar year is filled with symbolism. The half way point between the aspirations of January and the crunch of Christmas. It is the heart of the story – the ‘middle’ where the most ‘stuff’ is happening. It is a credit to this group that they were prepared to stop for a day to look at where they have come from and what is ahead. Mid-year ‘planning’ is a way of gathering the collective intention, resources and capacity of a team to ensure that progress is recognised and priorities are clear. As almost every workplace has discovered over the past few years – things change. Whether through global, economic, political or natural forces, change happens. By ‘regrouping’ mid plan, leadership teams are able to confirm the priorities, agree the messages and stay agile for the months ahead. Have you planned your mid-year strategy conversations? Whatever size your business, this is an essential process to ensure your direction is consistent with changes in your business environment and to make sure the story ‘makes sense’ of what needs to be done for the remainder of the year. Is instruction or direction better for engagement? Do you return from holidays full of direction or full of instructions? One is better for engagement. A leader I knew used the summer holiday as his ‘blue sky’ period. He would return from his trip refreshed and with a full to do list. His team had come to dread the return, as it frequently marked a change of strategy. In some cases this meant new efforts, change of direction, or even substantial reorganisation. For his team, there was an important step missing. While he had given himself the time to think through his ideas, to internalise them and to create a to-do list at the end, his team would be frozen, waiting for the action plan. Four weeks of iterative thinking would be downloaded in an hour. In the months leading up to the break, they would shut down their thinking on new ideas or directions, knowing that there was little certainty of priorities on their return. And once the action plan was presented, there was a feeling that even if they agreed with the solution, they didn’t feel a sense of ownership as their input was missing from the actions now dictated. The leader had come to believe that it was important that he take this time to make sure he provided clear instruction. But by doing all the thinking for them, he was missing an important opportunity to engage them in the problem and the solution. While there is great strength in aligning people behind a target, there is even greater motivation when people have context, information and an understanding of the problem or situation that they are seeking to solve. What could he have done differently? Balance destination, direction and detail. When it comes to implementation, people work with details. But before you get there, use the big picture to set the destination and establish direction. Your people might know a better route! Provide clear context. Why is the number one thing, the number one thing?Customer, competitor, political, technological, social. What are the factors that informed your thinking? Build the capability. Creating an environment that supports shared problem-solving, open communication, an outcome focus and clear decision-making takes time at first, but becomes a habit and can be done very effectively over time. By giving up some control, and creating an environment with open communication, clear context, and strong sense of purpose, leaders can help their teams achieve results they may not have imagined on their own. There are times, such as during a crisis, when instruction will still be important. There is substantial evidence that during these times an engaged workforce goes beyond simply complying with instructions and commits to the outcomes.